The reflection of a silver moon dances like a ghost on the water. Cool night breezes stir the rigging of a forty-five foot ketch anchored near the harbor of Santa Marta Bay. The family on board is fast asleep after a week of hard sailing, with nothing but the gentle sound of waves lapping against the sides of the boat to disturb their slumber. Around one-thirty, the captain of a Norwegian freighter steps out on deck for a smoke. He had noticed the ketch earlier as she was putting in across the way. Suddenly he hears the sound of a motor fall silent and notices a small dingy easing up along side her. The captain doesn’t like it. He slips inside, calls the harbor agent and alerts several members of his own crew… He’s sure he also saw the telltale glimmer of moonlight flashing on the blade of a cutlass. Meanwhile, two thieves have silently climbed onto the deck of the ketch, and in no time, they hold the startled skipper and his wife at knifepoint below. They demand the keys to the storage compartments. A larger craft silently arrives with more bandits. Brandishing guns and machetes, they quickly help themselves to the cargo. By now, the couple’s frightened children who were sleeping in the aft berth are also awake, and crying. Just then, a siren wails, as machine gun fire knocks one of the intruders on deck down the cabin steps. Immediately, the pirates abandon the heist, and make a run for it. The larger craft, a speedboat, gets away, but as Columbian customs agents open fire, they manage to kill two of the men in the small motor boat, including the driver. In the darkness, it’s difficult to tell just how many pirates have boarded the ketch, but with spotlights flashing, the agents block the vessel and manage to nab another of the bandits as he attempts to climb overboard. Moments later, they join the family to get a full report. The captain of the Norwegian freighter also arrives, with several crew members, ready to lend a hand. This above incident at Santa Marta happened years ago to the family of Savannah resident Albert Seidl, but it’s more likely to be repeated today. Since the 1990s, the world has seen a resurgence in piracy. Statistics show attacks rising dramatically since 2006, mainly in the China Sea, Straits of Malacca, Gulf of Aden, Somalia, Gulf of Guinea, and in the Caribbean, currently peaking in 2010, and tapering off somewhat in 2011 and 2012, thanks only to the combined efforts of maritime enforcement in international waters. Still, differing laws and treaties that govern the capture and prosecution of today’s pirates often pose dilemmas and legal obstacles for modern navies, leading to unsatisfactory results – pirates go free. While movie goers flock to films depicting Disney versions of the characters that roamed the Caribbean three centuries ago, modern pirates sail the waters of the twenty-first century equipped with technological weaponry and ready for warfare. Added to the growing treat of terrorism on the high seas, it’s safe to say that yacht owners had better make sure they know who, and where their friends are – before they set sail. Captain Albert Seidl was born in Essen, West Germany and educated at the Folkwang Academy of Fine Arts. He has spent his life combining his talents as a sketch artist and a painter with his love of ships and sailing. 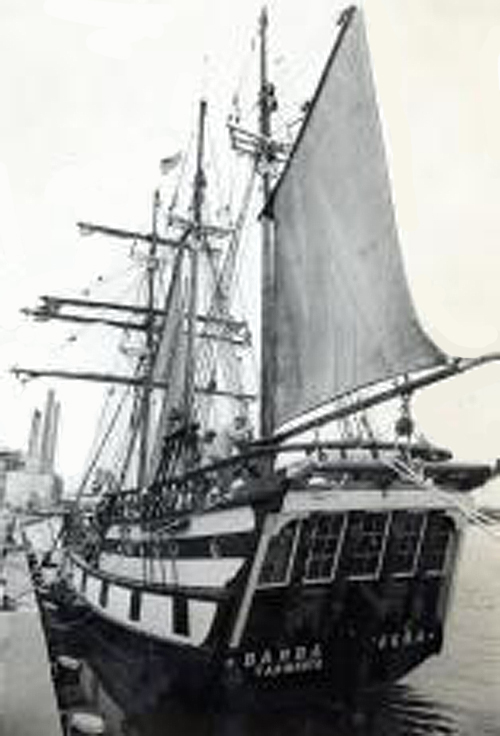 Seidl was the Skipper and co-owner of the Barba Negra (Spanish for “Black Beard”) – a 121-foot fishing ketch, vintage 1896 Norwegian Barquentine that once graced Savannah’s historic docks on River Street. Originally christened ‘Moder, or Mother,’ Seidl found her in Norway in 1971, and along with his business partner and captain, Gerhard Schwisow, restored her, and lived on board for over twenty-five years with wife Alise, and two sons. Incidentally, Schwisow was one of the crew members of the Norwegian freighter who came to Seidl’s rescue that night at Santa Marta. Barba Negra, 121-foot fishing ketch, vintage 1896 Norwegian Barquentine anchored at Savannah’s historic docks on River Street. During the 1974 and 1976 ‘Bicentennial Tall Ship Races’ in New York City, Seidl met Mayor John Rousakis who insisted the Barba Negra come south to Savannah for a visit. When she finally arrived in 1978, she stayed, and soon became the main attraction on the riverfront. In 1995, the vessel was rededicated as ‘Barba Negra – The Spirit of Savannah,’ with the River Street waterfront designated as her permanent home. 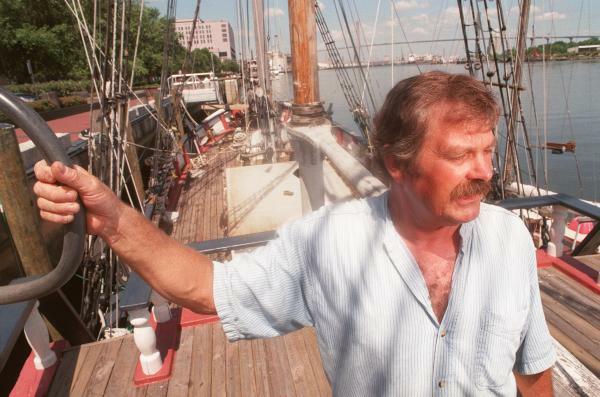 It was also the year Seidl finally decided to ‘come ashore.’ He bought a house in Savannah’s historic district and in 1996, he sold his interest in the ship to Schwisow. For a while, he and Alise would continue to crew on board the ship, and they made regular visits to friends and family on other working vessels. Capt. Schwisow eventually employed a 26 year-old Navy veteran, Capt. Frank Joseph Schwindler to run operations on the Barba Negra. Though in all probability the aged vessel’s career of high-seas sailing was over as more and more costly repairs mounted, Gerhardt Schwisow hoped to maintain her as a sailing school vessel, an alternative junior and senior ‘high school’ for young crew members under Schwindler’s direction. He also had dreams of another full restoration, but that was not to be. In the spring of 1999, the Barba Negra sank off Hutchinson Island during a terrible storm. The day before Savannahians woke up to the news, the vessel had been anchored off a dock at Hutchinson Island awaiting more repairs, but the bilge pump was not on that evening when the storm struck. Consequentially, the old ship quickly filled with water, and sank to the bottom of the Savannah River where it remains to this day. Thankfully, much of the ship’s beautifully crafted woodwork that was done by Albert Seidl, and the antique artifacts onboard the vessel had been removed to Seidl’s residence prior to the accident. Gerhard Schwisow aboard the Barba Negra docked at River Street. Even more tragic was the death of Gerhardt Schwisow on March 8th, 2006. It had long been Gerhardt’s desire to try, in vain, to raise the Barba Negra from the river, and the heartbreak of his untimely passing at age 59 was even more devastating when it was ruled an ‘apparent’ suicide. Years ago when Albert Seidl first migrated from Germany to Vancouver, British Columbia, he bought an ‘old sea chest’ through an estate auction. No one had bothered to open it for many years, and it was discovered to contain an authentic ‘treasure map.’ Seidl was inspired to build a sailing ship from scratch – a fifty-one foot auxiliary ketch fashioned like an ‘Indian war canoe’ that he called the Illahee (Chinook for ‘All My Belongings’ or ‘My Country’). Eventually he took the ship on an archaeological expedition to the Pacific, and the Caribbean and actually found a treasure on an island off the coast of Costa Rica. But his vessel fell into the hands of corrupt Mexican officials in league with local pirates, who discovered the map, confiscated his boat, and terrorized his family. It took two naval escorts to sneak him and his family out of Acapulco to safety. The episode at Acapulco was Seidl’s first encounter with pirates. The second encounter was the one previously described at Santa Marta Bay. For many years, Seidl had been under the impression that his beloved vessel sank somewhere in the South Pacific. In February 2014, through a miraculous twist of good fortune, he learned not only had she survived, but she had been bought several times, and thankfully, the name had stayed the same. Illahee’s newest owner, a West Coast sailing enthusiast and fellow artist had recently found her in rough shape, rescued her, and was planning a full restoration. Much to Albert’s delight, he also learned that most of his original solid woodwork was still intact. Visit Illahee Project, to learn more. Albert & Alise Seidl at Tybee’s Pirate Festival. These days Albert and Alise live in their residence in Savannah’s historic district. Although they still make time to sail with family and friends around the globe, they also spend a lot of time at City Market – he paints in his upstairs art studio. Seidl’s artwork hangs in numerous local venues, and he’s had solo exhibitions in over 22 countries worldwide. Alise recently closed the small ice cream shop below on Jefferson Street, that she ran for many years to pursue their new ventures. On special occasions, she and this most distinguished sea captain don what might be mistaken as an authentic ‘pirate’ costumes. Albert’s eyes twinkle as he twirls his white moustache and admits to flying the ‘Jolly Roger’ from the mast of the Barba Negra in the old days when custom’s officials were particularly uncooperative. 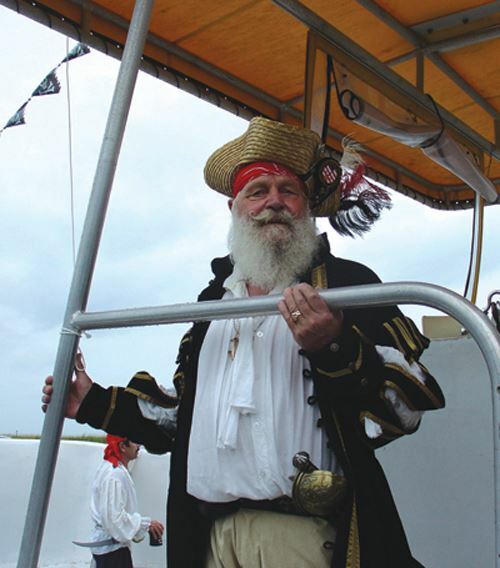 Dressed in full regalia, with tiny skulls and crossbones woven into his beard, he could pass as a character right out of Treasure Island, but he says with sincerity and genuine pride, “I’m not a pirate, I’m a brother!” He’s referring to his membership in The Brotherhood of the Coast. In 1951, a small group of Chilean sailors formed a modern sailing alliance inspired by law or custom of the coasts, an ancient code of conduct that has bound seafarers together in mutual respect for the sea, and for one another since the days of antiquity. Drawing upon their rich maritime heritage and the legends of the musket bearing “buccaneers” from the island of Tortuga, the seven founders penned eight basic principles derived from the old code, now known as the ‘Octalog,’ to govern the alliance they called Hermandad de la Costa, literally ‘Brothers, or Brotherhood of the Coast.’ The word spread to sailors in other localities, an international fraternal order was born. Thirty-three countries now have established ‘Tables’ (or groups) of buccaneers. The rugged, fighting men from Tortuga known as Frères de la Coste (Brotherhood of the Coast) once lived by such a code. These men were called ‘filibustiers’ by the French, or ‘boucaniers’ from the word ‘boucan’ meaning the place where strips of meat (and sometimes the flesh of an enemy) were hung out to dry, or ‘barbecued’ in Indian fashion. They hunted the wild herds of cattle that roamed the island of Hispanola, (now Haiti and the Dominican Republic), and were excellent marksmen, fiercely loyal to one another, and totally unafraid of death. They also had a deep hatred of the Spanish, and in the mid sixteen-hundreds, they joined forces with Henry Morgan’s English and Dutch ‘privateers,’ and French corsairs to carry out raids against Spanish settlements throughout the Western Caribbean. Though self-serving and brutal, pirates of the 17th and 18th centuries were often at war with the perceived tyrannies and social ills of their day. Some would argue that modern pirates do the same, but according to The Brotherhood of the Coast (BOC) Chilean interpretations of the spirit of the old code, today’s pirates have strayed considerably when they make war against international maritime law – a universal standard for peace and civility on the high seas. In First Watch, the US Brothers of the Coast printed newsletter, and The Tortuga Post, the official international newsletter of the BOC, numerous articles have cited “an increase in acts of piracy and violence as noted by seamen, worldwide,” stating “pirates are increasingly more powerful, armed and organized. All types of ships are concerned, but freighters, from which pirates plunder the cargo (and sometimes seize the ship, disguise it and resell it), fishing vessels and yachts are main targets. Sometimes it involves the taking of hostages, and the demand of ransom, and too often, the death of men: 72 in the year 2000.” The article goes on to state the United Nations has handed down a mandate that all those with maritime interests take measures to fight the “exactions of pirates,” citing recommendations, “means for prevention, and attitudes to be observed”. Savannah, Georgia’s Table of The Brotherhood of the Coast was formed in 1992. Seidl was one of the co-founders, and its first Table Captain. Members lead separate lives (some reside in other parts of the country) but these distinguished professionals with busy schedules manage to savor the seas together. Experienced captains and tall ship enthusiasts, they take time to socialize, race, go on sailing excursions, and crew on one another’s vessels. Individual sailors travel often, with spouses and families to visit other BOC members throughout the United States and abroad. The international organization is composed of men and women from all walks of life. As sworn protectors of the earth’s oceans, many work for the preservation of coastal and maritime environments. Renowned explorers such as Jacque Coustou, and inventors like Thor Haierdahl were among the ranks. Every four years, the worldwide ‘fleet’ comes together in festive gear for a celebration at a designated port of call. Tables in twelve cities across the United States host national ‘Zafarranchos’ (gatherings) every other year. Like the buccaneers of old, it doesn’t take much to get these twenty-first century ‘brothers’ on board a ship headed for adventure, and their commitment to one another spans the globe – come pirates, hell or high water!